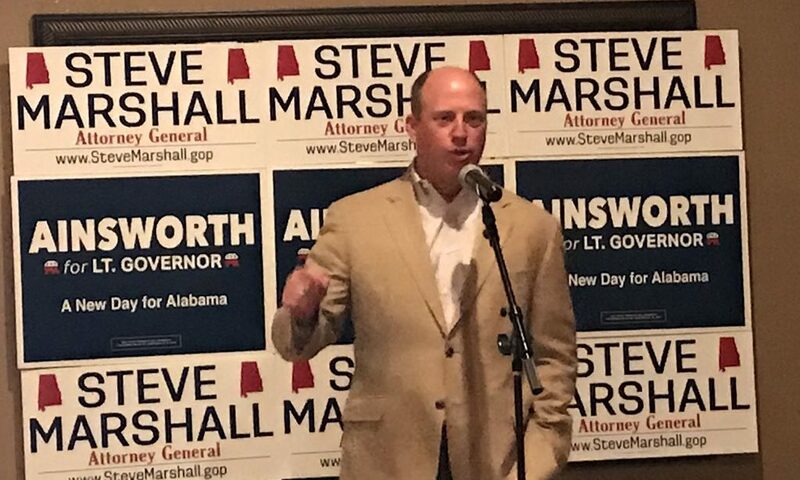 Saturday, with just ten days to go before the general election, Republican Lieutenant Governor candidate Will Ainsworth and Republican Attorney General candidate Steve Marshall attended a get out the vote rally in Albertville, with special guest Congressman Mo Brooks, R-Huntsville. “It has been a blessing to have a friend on the campaign trail like Will Ainsworth,” Marshall said. “As we have gone around the state, the one thing I knew is who he was, and he knew who I was despite of some of the things that have been written. He has a vision and a passion for the state of Alabama. We are on the cusp of doing some remarkable things in Alabama. “Aren’t we honored to have the best Attorney General in the nation,” Ainsworth said. “I have a passion for education,” Ainsworth state. “I want the children of Alabama to have the same opportunities that children in other places have.” Ainsworth cited technology, workforce development, and charter schools. “Socialism is what they have in Cuba and Venezuela where 90 percent of the people barely have enough to eat and are struggling to live while the elites are doing well,” Brooks said. Marshall faces Joseph Siegelman (D) in the general election. Ainsworth faces Muscle Shoals area pastor Dr. Will Boyd (D). Congressman Mo Brooks is being challenged for the Fifth Congressional District by former Huntsville Attorney Peter Joffrion (D). The general election will be on Tuesday, November 6. Polls open at 7:00 am and close at 7;00 pm. You must be a registered voter to participate and you must bring a valid voter ID.